Creep is more likely to occur as the temperature rises under a certain amount of stress. Therefore, creep resistance is one of the important qualities of such heat resistant steel structures as industrial boilers that are operated at high temperatures for long periods of time. Such heat resistant materials include Cr-Mo steels, stainless steels, and superalloys. When a metal specimen is kept under a constant stress at a constant temperature, the specimen deforms exhibiting a strain curve or a “creep curve” over time as shown in Figure 1. The creep properties of a metal can be obtained either by “creep testing” or “creep rupture testing.” In creep testing, the creep rate is determined by continuously measuring the tensile strain of a specimen in conditions of constant stress and temperature. The creep testing methods are specified in national standards such as ASTM E139 and JIS Z 2271. 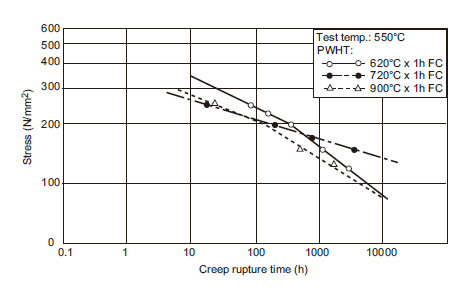 In creep rupture testing, the time it takes for creep rupture to occur when a specimen is kept under constant stress and temperature reveals the creep rupture strength. The creep rupture testing methods are also clearly specified, for example in ASTM E139 and JIS Z 2272. In general, creep rupture testing is often carried out, and the test results are widely used as the basic data for designing structures to withstand elevated temperatures. Diagrams of stress in relation to rupture time obtained through creep rupture testing show straight lines or broken lines as shown in Figure 2. With this diagram, the creep rupture strength over a specific amount of time can be determined. In addition to strength, creep rupture testing provides information on elongation, reduction of area, and the character of fractures; therefore, it is possible to compare different materials in terms of their creep properties. Figure 2: Typical diagrams of stress to rupture time in creep rupture testing of 2.25Cr-1Mo weld metal. The creep properties of materials can be affected by such factors as chemical composition, production method, heat treatment, microstructure and crystal grain size. 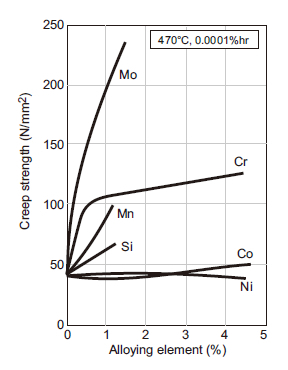 As shown in Figure 3, the creep strength of materials can be influenced by the kind and amount of alloying element, with Mo as one of the most effective elements that improve creep strength. On evaluating the creep properties of steels and weld metals, differences in metallurgical structure, chemistry, production process and thermal cycle should thoroughly be examined. Lately, operation temperatures and pressures of heatresisting equipment tend to be higher to improve production efficiency. To keep up with this trend, welding consumables have also been improved to provide sufficient elevated-temperature creep properties equivalent to those of advanced steel materials. Figure 3: Creep strength vs. alloying element for pure iron.